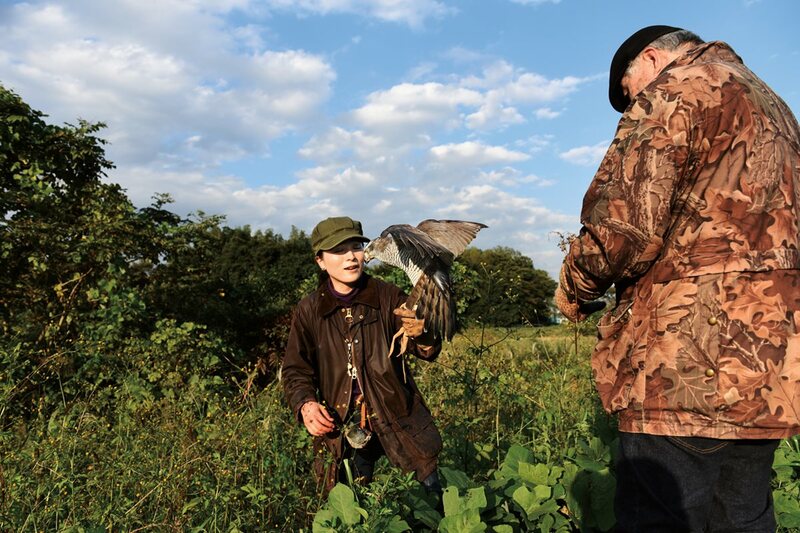 “He knew what the hawk thinks and feels,” says Noriko Otsuka, 45, of her first meeting 20 years ago with mentor Zenjiro Tagomori, 68, who is the 17th-generation head of the Suwa Falconry Preservation Society. He stands. The hubbub dies down. Those seated, awaiting their food, listen with respect as a speech dwelling on the importance of tradition flows past their ears. The master’s words reach back across the centuries to highlight those who came before, then link forward to mark the path the listeners themselves have chosen. Somber yet informal, stooped but spry, his thinning white hair combed straight back, he carries the listeners with him. Toward the end he gestures, and a younger woman by his right side stands to join him. She bows her head as he talks, then smiles as he hands her a scroll. The listeners applaud and take pictures with their mobiles. But this is not an awards event, nor a prize-giving. The setting is not an arena, nor a banquet hall. The walls of this cluttered room are sliding panels of paper. Overhead hangs a single bulb. A poster pinned behind the speaker shows a cursive character encircled in white on a blue field; it reads “wind.” The listeners are nine women and two men. They sit shoeless on floor mats around a low table, and their legs are folded beneath them. In a field outside Tokyo, Tagomori and Otsuka prepare a flight and, top, Tagomori sets his falcon to wing. Late last year Tagamori named Otsuka the 18th falcon master of the society whose practices were embraced for more than 1,200 years by the elite warriors known as samurai. 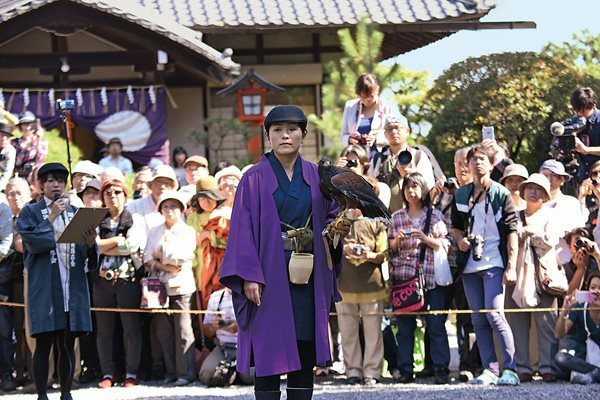 The speaker, Zenjiro Tagomori, is the 17th-generation head of the Suwa school of falconry, a tradition of Japan’s emperors that extends back centuries to the era of the samurai. Around the table is his current crop of students. Bird pictures crowd the walls. And the reason for the festive gathering is that Tagomori, who is 68, is stepping down. As of this night, the recipient of that scroll—Tagomori’s protégé of 20 years, Noriko Otsuka—is Suwa’s 18th-generation falcon master. She smiles, says a few words marking the honor of the occasion, takes more applause, and the cheerful hubbub resumes as everyone reaches across the table to pass bowls of vegetables and fish, and tucks in. From the darkness outside this cramped little party, in this tumbledown shack on a rural mountainside in Mitake, west of Tokyo, an unearthly screech breaks the still of the enveloping forest. During a weekend workshop for young falconers, Otsuka and Tagomori train students how to care for raptors—prune feathers, clip and sharpen talons, feed with pigeons and recognize when a bird is stressed or sick. 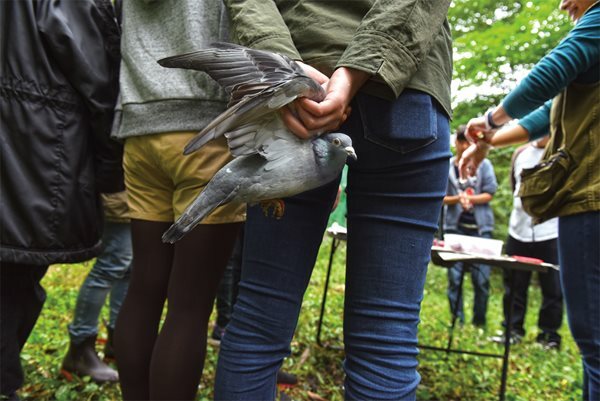 Lower: A student holds a pigeon that will be used in the demonstration. In 2010 the United Nations Educational, Scientific, and Cultural Organization (unesco) declared falconry to be part of the Intangible Cultural Heritage of Humanity. Perhaps most familiar in the West from its prominence in the courts of medieval England, falconry—or “hawking,” as it has also been called—is a catch-all term for the sport of hunting with raptors, or birds of prey, and the long process of training that enables a human handler to work effectively with a wild raptor. Falconry is older than recorded history. It probably began when nomadic herders observed eagles killing prey in open country and glimpsed the potential in training them to hunt for human benefit. One popular theory suggests that happened first in Mongolia, perhaps more than 5,000 years ago. Another claims it was in Persia, or it may have been somewhere on the vast Central Asian steppe in between. Either way, there is evidence that falconry was already being held in high esteem in Mongolia during the first millennium bce, when military campaigns brought the practice westward. Coins from Greece show Alexander the Great (who died in 332 bce) with a falcon on his fist. Celtic tribes introduced falconry to the Romans in the fourth century ce, after which falconry remained popular in Europe for more than a millennium. But as the necessity of hunting for food receded, falconry became loaded with cultural meaning. In England, it became tightly woven into the aristocratic world of knights and nobles, codifying divisions between social classes. In Arabia, poets extolled the virtues of patience, endurance and self-reliance cultivated by hunting with birds. 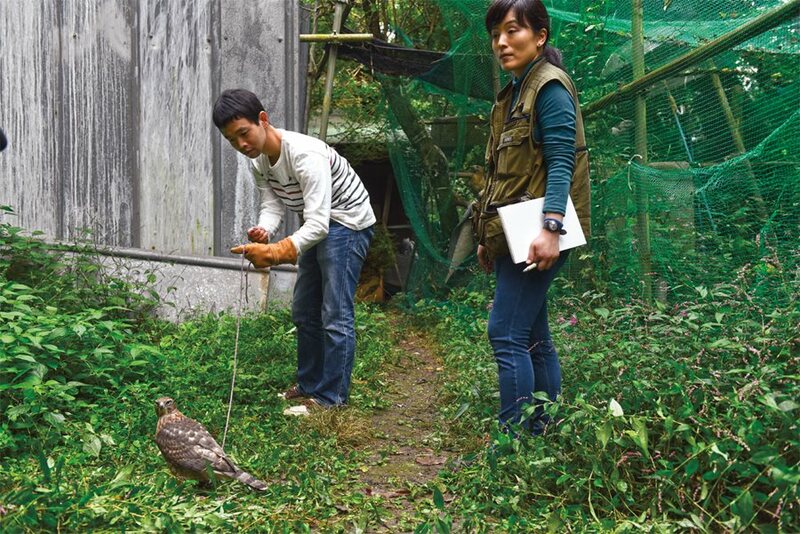 Under Otsuka’s eye, a student coaxes a tethered bird toward his arm at the Suwa Falconry Preservation Society. Otsuka says that for the first three years of her training, “I just watched and helped,” before she could fly and care for falcons herself. Practiced chiefly by social elites across much of the world, with regional variations but a broadly similar base level of knowledge, falconry took on further layers of significance as a form of diplomatic communication. Kings and princes exchanged falcons, compared techniques and developed vast holdings of lands, birds and handlers. One example centers on Frederick ii, Holy Roman emperor between 1220 and 1250, and king of Sicily. Falconry, which is mentioned in the Qur’an, had been practiced in Arabia for many centuries before Frederick began to establish links between Arabian and European traditions: From his court in Palermo, Sicily, he consulted with Arab falconers, imported Arab falcons and ordered a number of Arabic and Persian treatises on falconry translated into Latin for wider European consumption. And falconry also went east. 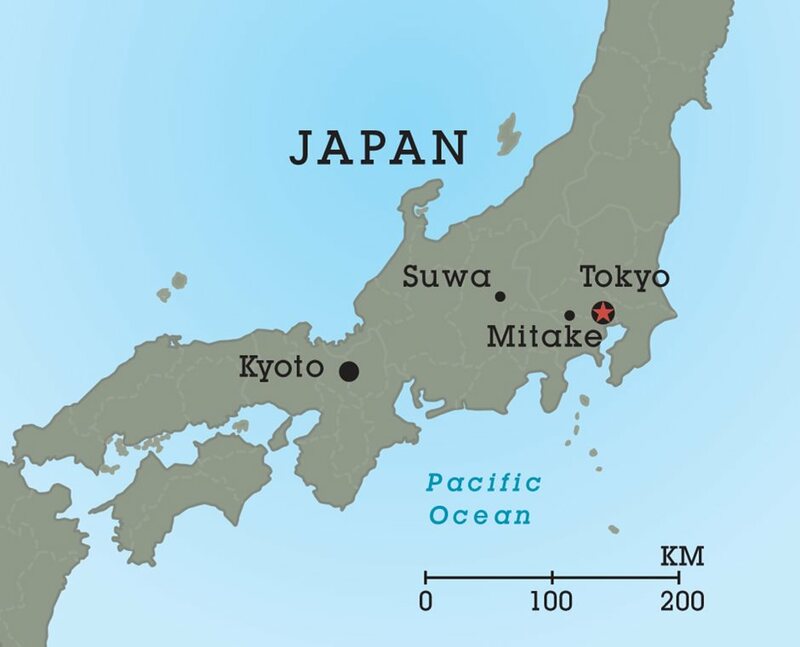 It is documented from as early as the seventh century bce in China, and then, via the Korean peninsula, it crossed the sea to Japan, where written records date its arrival at 355 ce. “Japanese falconry is closely related to the prestige of the emperor,” says history professor Yasuhiro Nihonmatsu, one of the few researchers in the field. A key function of emperors throughout Japanese history has been to secure the cultivation of rice. The most powerful symbol of successful rice stewardship is the crane—a grayish-white, long-necked, leggy bird that would fly in after the harvest to feed on abandoned rice husks. High in the mountains of Yamagata province, 320 kilometers north of Tokyo, winter can bring as much as four meters of snow. An added layer of complexity references Japan’s indigenous religion, Shinto, in which everything—animal, plant and mineral—is deemed to have a spirit. Over more than 1,000 years, Japanese falconry also took on a military aspect, as local lords (daimyo) rode out on horseback with falcons on their fists to assert dominance over their territory. Falconry became bound up with sovereignty, law and religion, permitted only for the emperor and the aristocracy. But as the elite warrior caste known as samurai rose to prominence, they consistently flouted imperial prohibitions on falconry. 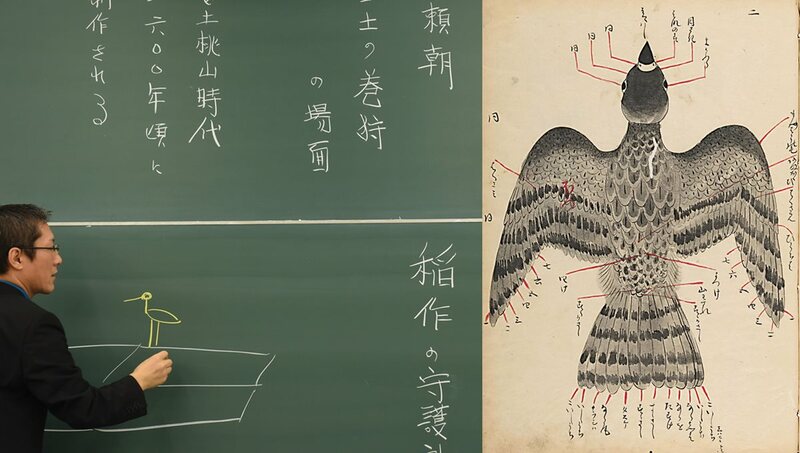 Ten such edicts are recorded between 794 and 1333, even while samurai pilgrimage flourished to the important Shinto shrine devoted to the falcon at Suwa, in the Nagano mountains, to learn the Suwa style of falconry—reverent, tradition-based and esoteric. In 1603 Tokugawa Ieyasu (1543–1616) was proclaimed shogun, the military ruler of Japan who exercised power in the name of the emperor, founding a dynasty that would endure for the next two and a half centuries. Ieyasu was a keen falconry enthusiast, and with his approval the samurai openly embraced falconry as a symbol of a new national order. 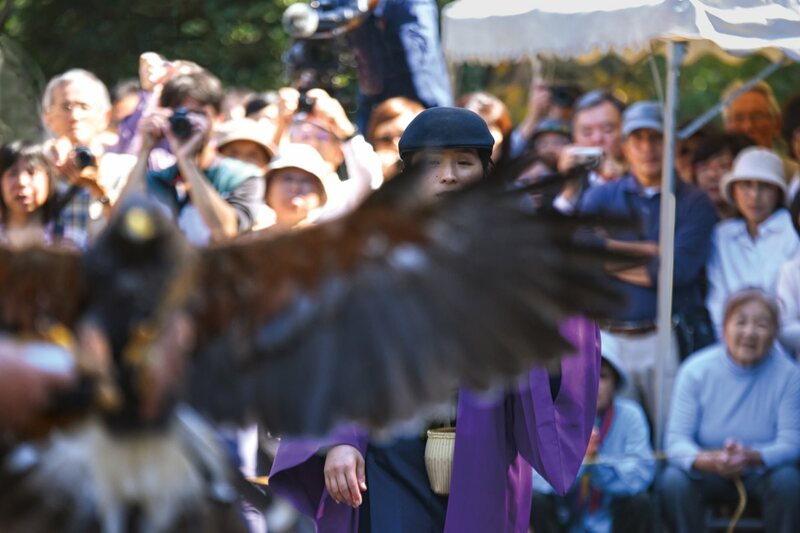 A demonstration of falconry became a demonstration of power, embodied for more than half a millennium by the leaders of the Suwa school. “Japanese falconry is closely related to the prestige of the emperor,” explains Yasuhiro Nihonmatsu of Shizuoka University of Art and Culture, where he is an assistant professor and one of the few researchers of the history of Japanese falconry. “Falconry is related to keeping the rice spirit in the human world,” he says, referencing Japan’s indigenous religion, Shinto. “The emperor had to prevent the spirit’s being removed, and did so by training falcons to catch the cranes that would try to leave the paddies with a bellyful of rice.” Right: This annotated illustration by renowned calligrapher and falconer Jimyoin Motoharu dates to the late 16th or early 17th century, and he copied it from an original dated 1328. Noriko Otsuka talks slowly, quietly and very carefully. She weighs each thought before speaking, sometimes for minutes at a time. In a week with her—at the festivities in Mitake, at a training session with students, eating together, watching her fly hawks in riverside fields—I got the distinct impression that unspoken communication matters more to her than words. She listens. She notices. She waits. 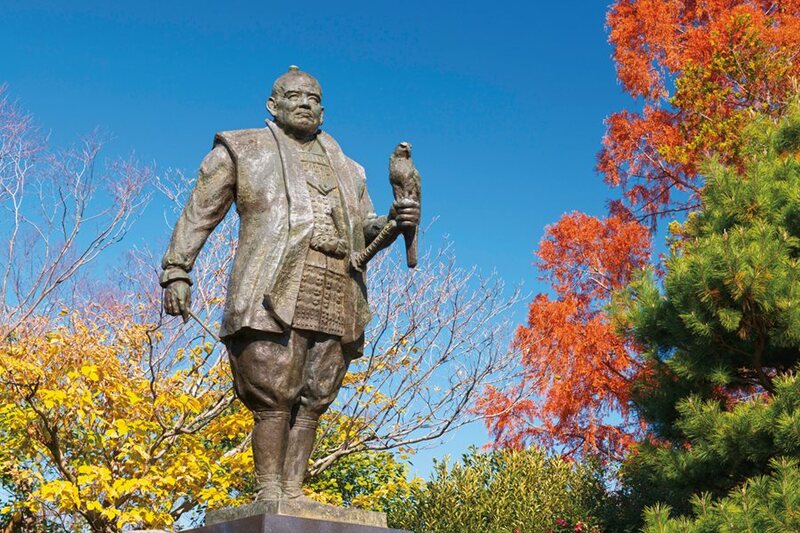 Outside Sunpu Castle in Shizuoka city, a statue of Tokugawa leyasu, founder in 1603 of the Tokugawa shogunate, shows the military leader’s enthusiasm for falconry as both sport and symbol of power. Now 45, Otsuka was born in Chiba, south of Tokyo. Her father is a successful businessman. In college Otsuka began to explore urban parks—“artificial places,” as she calls them. For her 1994 graduate paper in sports anthropology, she searched for a subject that could embody a link between people and nature. After three years of study, Otsuka scraped together enough money, and confidence, to buy her own falcon. Now, 20 years on, she trains her own students, like many Japanese falconers using birds bought from European breeders. Japanese law on local capture of wild raptors is strict. In the Mitake forests, I watch as Otsuka and Tagomori lead a class through some of the basics. The venue is Tagomori’s home, a wooden shack set amid broadleaf woodland a short hike above a country road on the slopes of Mount Mitake—a holy mountain whose summit hosts a 2,000-year-old Shinto shrine. It’s October, and the leaves are starting to turn. “This is the season to start educating the falcon,” Otsuka says, as she guides me behind the house, past tall, meshed enclosures set into the tree cover, past a dog kennel, to a small grass clearing. Below, a stream gurgles away to join the Tama River, which flows on through Tokyo and out to the Pacific. Above, hidden by the foliage, a waterfall crashes. Silent in the deep shade of its enclosure, an erect Harris hawk watches us pass. As a dog barks ahead of us, the hawk suddenly screeches, the same sound I heard during the evening celebration—a cold noise of rending metal close to my ear that squirts danger and ancient superstition and wild fear into my muscles. I stumble a little. This Northern Goshawk is among the birds cared for and flown by students at the Suwa Falconry Preservation Society. Death is close, but not mine. Eleven students are gathered in the clearing. An ax has been thwacked into a stump by its blade. Logs smolder in a rusted oil drum. Simply dressed in a hiker’s vest and narrow-leg jeans, her hair tied back, Otsuka holds a live pigeon in one hand, gripping lightly but firmly behind its wings so the bird is immobilized. She is explaining the importance of patience, respect and gratitude for the falcons and for the nature all around. The students, a touch incongruous in their urban casualwear, are mostly in their 20s and 30s with office jobs in the city. They have each paid ¥30,000 (roughly us$300) to sign up for Otsuka’s October-to-March half-year course. Otsuka talks while gathering equipment. A heavy gauntlet protects Otsuka against sharp talons. At the back of the group, Satoko Sakakibara, 28, a reserved, bespectacled office administrator, has brought out the Harris hawk. It perches on her gloved fist. Its name is Nowaki, which means “Fall Storms.” Half a meter tall, the bird bobs and stares, all curves—curved black talons, curved pin-sharp beak, hooked yellow toes, coiled energy beneath an arched back of chestnut-brown plumage. “I first handled birds in 2011,” Sakakibara tells me. There’s no danger, but it’s still disconcerting to chat with such a beak so close. As she talks, Tagomori—avuncular, slightly stooped, in a simple fleece top—is apologizing (“I’m no good at this; I feel too sorry”) as he quickly and without fuss ends the pigeon’s life, its neck squeezed between his knuckles. Within a few minutes, the pigeon has been plucked and its organs laid out on the blood-smeared table for the students to identify. Death is integral to falconry. Otsuka discusses raptor nutrition. All the meat will be used. But Nowaki isn’t here to eat. Instead, Otsuka demonstrates wamawari—walking around the clearing with the hawk (which weighs almost a kilogram) perched calmly on her outstretched fist. Her body absorbs the unevenness of the ground; the hawk feels no wobbles. Strength and poise can be learnt, but it strikes me that the inner discipline required for falconry perhaps cannot. Some students copy Otsuka, making a circuit with Nowaki. Less confident beginners walk instead with a liter bottle of water balanced on a forearm. Otsuka and Tagomori’s reverence for nature, and the emphasis they place on discipline and calm, brings home that their falconry isn’t a sport, and that these birds aren’t pets. It’s also no longer about hunting for food. So what is it? Tagomori sits on the floor matting in his Mitake house, beside a low table crowded with books and papers. He sips tea as he tells the story of browsing Tokyo libraries as a young man in the mid-1960s and unearthing a work by Kaoru Hanami, at that time falconer to the Japanese imperial household and 16th-generation head of the much reduced Suwa school. A sympathetic archivist guided him to meet Hanami in person. By then the formal link between falconry and the imperial family had been broken: Although the Imperial Household retained the post of falconer, since 1945 traditional forms of hunting and ceremony had been ended. Hanami nonetheless accepted Tagomori as a pupil and, on his retirement in 1976, continued supporting efforts to keep falconry skills alive amid rapid social change. With an eye for a slogan, Hanami redefined the Suwa tradition as Jinyoh-Ittai, or “Human and Hawk as One.” He named Tagomori his successor. This chimes with the atmosphere at Mitake. 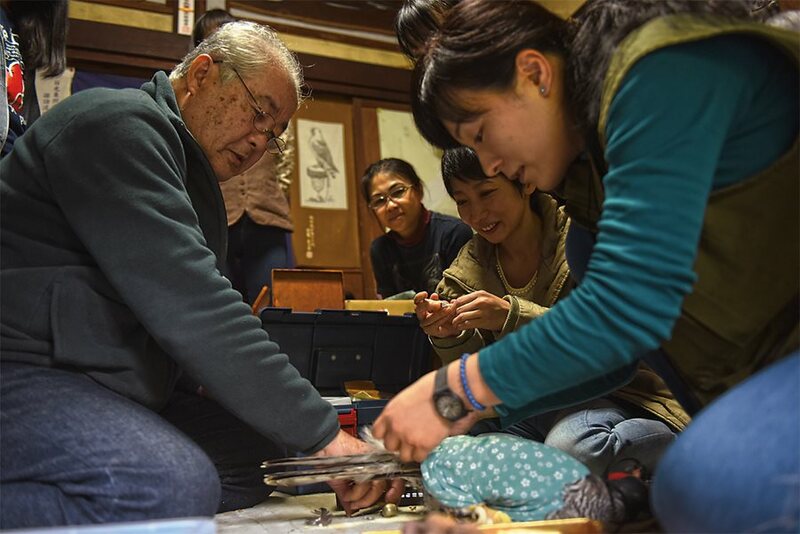 But the Suwa school—now retitled the Suwa Falconry Preservation Society—is a shoestring operation in the hands of a few individuals, reliant on tradition, isolated within its own country. How could it secure a viable future? Soon after Hanami’s memoir, The Emperor’s Falconer, was published posthumously in 2002, Tagomori was contacted by the organizers of the Abu Dhabi International Hunting and Equestrian Exhibition (adihex), an annual world gathering of experts and practitioners of field sports. They’d seen the memoir, and with Japanese falconry largely unknown outside Japan, they were inviting Tagomori to adihex for mutual benefit, to broaden knowledge and share experience. 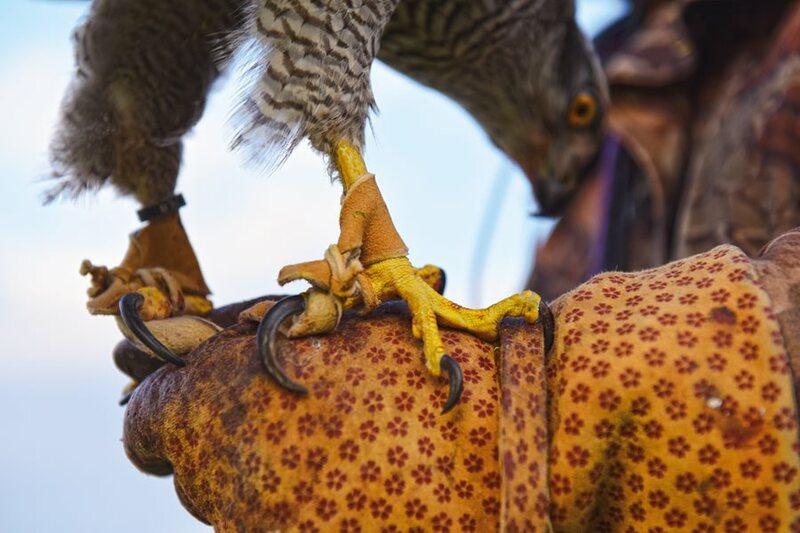 Falconry in the countries of the Arabian Peninsula has become one of the symbols of nationhood, a cultural endeavor rooted in centuries of practice. According to the International Association for Falconry, the Middle East hosts half of the world’s falconers. As it was a thousand years ago, the Peninsula is again a center for world falconry. And everybody goes to adihex. Otsuka visited adihex with Tagomori in 2005 at the invitation of the Emirates Falconers Club and has been back every year since. She has done a three-month internship at Abu Dhabi’s world-renowned falcon hospital, she has compared techniques and traditions with Arab falconers (including Crown Prince Mohammed bin Zayed of Abu Dhabi), and she is exploring ways of forging deeper links with the region to help raise awareness of Japanese falconry. She also senses an affinity between traditions. October 19 in Japan marks an important festival date. Every year on that day, the former imperial capital of Kyoto commemorates the city’s conquest in 1568 by the daimyo Oda Nobunaga—one of the early allies of the falcon-loving shogun Tokugawa Ieyasu. 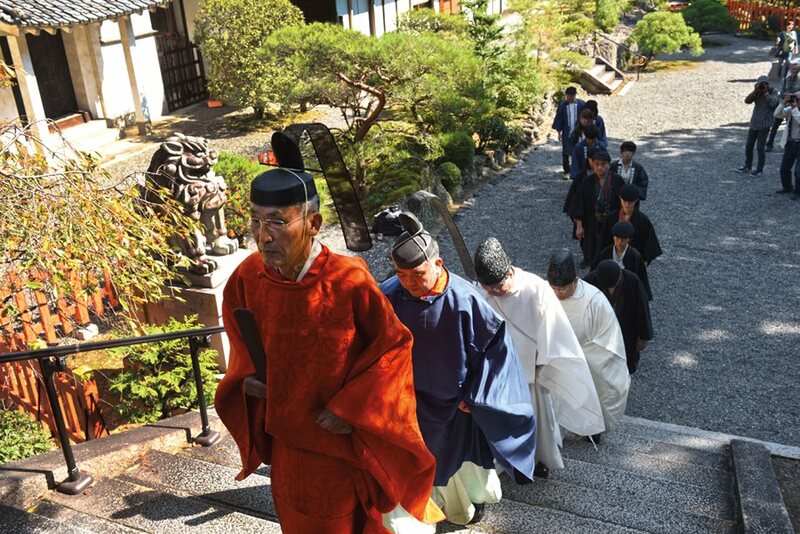 Celebrations focus on Kyoto’s Kenkun Shrine, a Shinto holy place dedicated to Nobunaga—now a national hero—which hosts a religious service mixed with cultural performances. This year the Suwa falconers are guests of honor, participating in the public worship and also offering a demonstration of their skills. I’m with them backstage as they prepare. Otsuka has brought both Nowaki and her smaller goshawk Murakumo (“Gathering Clouds”). She, like her companions, is in traditional costume: a cross-fronted tunic, knee-length cape, beret-style cap and distinctive split-toed boots, with a whistle, lure and a box at her waist that holds raw meat scraps. She smiles and straightens up. In ceremonial procession, priests of the Kenkun Shrine in Kyoto lead the Suwa falconers to one of the cultural performances during the Funaoka Grand Festival, held annually on October 19. Below: Now standing as a falcon master, Otsuka carries on the traditions. As the event begins, led by white-robed, wooden-clogged Shinto priests, the shrine compound is packed with hundreds of people, observing in silence as rice, fish, seaweed and salt are solemnly presented to the deified spirit of Nobunaga residing within the inner sanctum. A ritualized performance of noh theater is followed by bugaku, a 1,200-year-old form of masked dance, its reedy, discordant music of high flute and slow drum leaving—from the looks on faces all around—a 21st-century audience spellbound. Senior priest Takako Matsubara steps forward to deliver an address. Their display adheres precisely to a tradition that reaches back centuries, faithfully maintained by the Suwa falcon masters. It passes in the sunshine of midday to murmurs of wonder rippling around the crowd as the hawk swoops. “I try to explain to people that birds of prey are sensitive, and that falconry is a sustainable, very ancient practice,” says Otsuka. “From the hawk you learn who you are,” adds Tagomori. Later, as the falconers pack up, Otsuka reflects on her journey. And he looks across at Otsuka, his pupil-turned-successor. “I think this will last very well,” he says. Seattle-based multimedia journalist Steve Shelton has covered stories in the US, Middle East, Balkans, Central America and Sudan for a wide variety of news publications as well as nonprofits and commercial clients.